Posted on 15, December 2015 by EuropaWire PR Editors | This entry was posted in Automotive, Germany, Industrial, Management and tagged Dieter Bellé, Dr Frank Hiller, Leoni AG, Wiring Systems. Bookmark the permalink. Nuremberg, 15-12-2015 — /EuropaWire/ — The Supervisory Board of Leoni AG, the leading European provider of cables and cable systems to the automotive sector and other industries, assigned responsibility for the Wiring Systems Division to Dr Frank Hiller (49) during its meeting today. A member of the Management Board since April 2014 and hitherto in charge of the Wire & Cable Solutions Division, Dr Hiller will assume his new position effective 1 January 2016. Furthermore, Dieter Bellé (59), currently both CEO and CFO, is to concentrate on his executive role as Management Board chairman in the future. Dr Werner Rupp, Chairman of Leoni AG’s Supervisory Board, said: “Today’s decision is a sign of our confidence in Frank Hiller. The Supervisory Board is convinced that, with his many years of experience in the automotive industry, he is an ideal appointment to lead the Wiring Systems Division back to its targeted course of profit-oriented growth.” As an interim solution, Dr Hiller has already been managing the Wiring Systems Division together with Dieter Bellé since the beginning of November and is consequently involved particularly in implementing the performance enhancement projects. The Supervisory Board has already initiated a clearly structured process to search for a successor to head the Wire & Cable Solutions Division. The Chairman of the Management Board, Dieter Bellé, and Dr Frank Hiller will jointly manage the division on a temporary basis until a successor is appointed. The Supervisory Board also decided today to abrogate the dual position of CEO and CFO. Dieter Bellé, who took over as Chairman of the Management Board in May 2015 and, in addition, continued in his position as Chief Financial Officer, will, given the Group’s expansion and further globalisation, concentrate on his CEO duties in the future. The Supervisory Board will appoint a new Chief Financial Officer and thus a fourth member of Leoni AG’s Management Board as soon as possible. Currently, Leoni AG’s Management Board consists of two members. 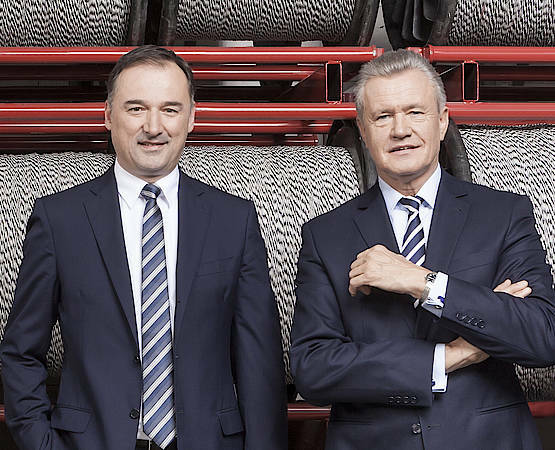 Dieter Bellé (right), currently both CEO and CFO, is to concentrate on his role as Management Board chairman in the future. An additional member of the Management Board will be appointed Chief Financial Officer as soon as possible. Dr Frank Hiller, in charge of the Wire & Cable Solutions Division at present, will head the sister divison Wiring Systems effective 1 January 2016. The search for a successor to assume responsibility for the Wire & Cable Solutions Division is ongoing. Thus, the Management Board of Leoni AG will again consist of four members in the future.